You are currently browsing the tag archive for the ‘New Horizons’ tag. Today (June 30th) is asteroid day. For this auspicious (yet anxious-making) holiday, I have been saving two asteroid-related miniature stories ripped from the headlines. First, we return to the dwarf planet Ceres, the largest object in the asteroid belt. We need to revisit the bright spots upon the dwarf planet’s surface. Ever since the New Horizons spacecraft began to approach the little world, these glistening spots have fascinated the astronomy community. Initially scientists thought that the spots were composed of hydrated magnesium sulfate (a substance quite similar to the Epsom salts sold for bathing and foot-soaking), however it now seems like the shiny patches are made of something else entirely. According to astronomers, the particular chemical in these glistening patches actually turns out to be sodium carbonate–a salt formed from carbon. On Earth, this chemical usually forms in evaporitic conditions–when water evaporates from a lake, sea, or hot springs. This seems to indicate that the geology of Ceres is more complicated than initially thought—instead of a big ice crystal which has always been the same, the miniature planet has undergone changes: surface water evaporated to leave these mysterious chemical deposits. Hopefully finding out about Ceres’ past can teach us more about how planets form (or don’t form). Second, we turn our eyes back closer to Earth to take in the newly discovered “second moon” a tiny asteroid about the size of the great pyramid of Giza which seems to be orbiting Earth. This new asteroid, called 2016 HO3, is not really a true moon but a quasi-satellite: it sometimes loops around our planet because Earth and the little rock both orbit the sun on a similar circuit. The asteroid orbits the sun in 365.93 days (just slightly longer than Earth’s orbit of 365.24 days). Thus, for the next few hundred years it will act like a true moon as our orbits converge. The rock is about 40 meters (130 feet) across by 100 meters (328 feet) wide. It is a bit strange to think about it up there hidden in the darkness, but it is a fairly comforting asteroid day story. 2016 HO3 is never destined to hit Earth. The really bad asteroids seem to be the ones we don’t know about (so it is time to keep our eyes on the skies and learn more). As promised we are dedicating today’s post to the New Horizons spacecraft. The unmanned robot probe (which is the size of an unwieldy motorcycle) flew past Pluto at 7:49 a.m. EST, traveling at nearly 50,000 kilometers per hour (31,000 mph). At its nearest approach, the craft was only 1200 kilometers (7500 miles) above Pluto’s surface—closer to Pluto than Brooklyn is to Botswana. Because of the shape and size of the solar system, the telemetry of the mission, and the niceties of radio-communication, NASA did not receive the information dump from the spacecraft until 00:53 GMT Wednesday which is uh…approximately right now! So I haven’t had any time to groom the Pluto data! Today’s post is thus more of a laurel. 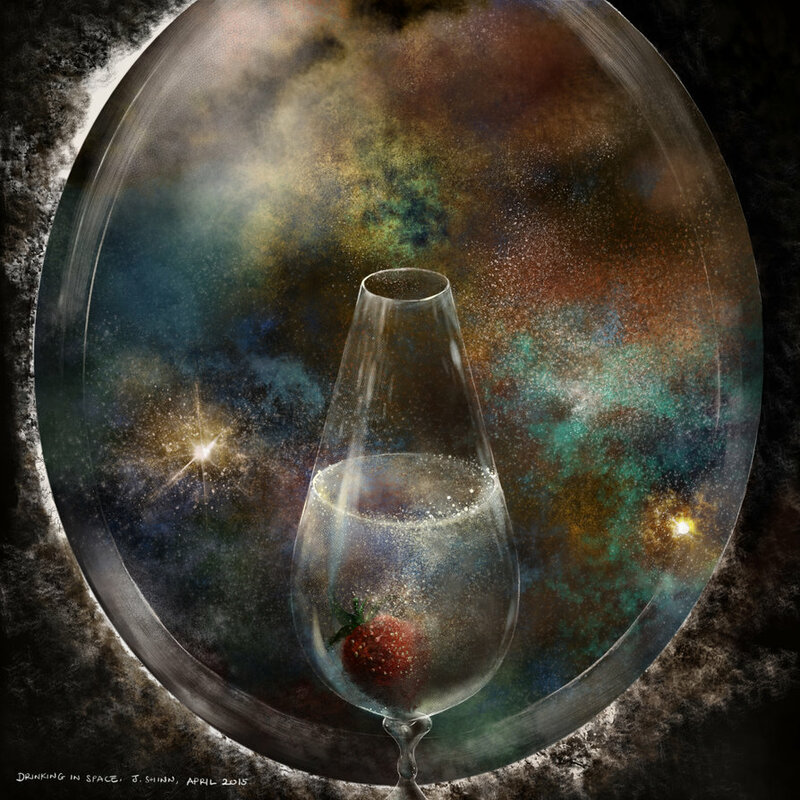 But the information does exist—the craft survived and completed its mission. We have a trove of knowledge about Pluto to help scientists understand the nature of the solar system—or to conceive of what kinds of new questions to ask about other planetary systems. Maybe I’ll be desperately writing another post tomorrow if scientists unexpectedly find canals on Pluto or discover that Nyx is really a giant egg or something, but most likely this data will take a long time to process and understand. Such is the nature of science (and most worthwhile pursuits). So what is the purpose of this post? I have never been unduly upset about the designation “dwarf planet” for things like Pluto, Ceres, Eris, and Haumea. However I did grow up with “My very educated mother just served us nine pizzas” (a much snappier mnemonic than “My very educated mother just served us nothing”), and the idea of Pluto as the final planet still holds undeserved weight in my subconscious. I have thus been taking NASA’s self-congratulatory PR announcements seriously when they say “we complete the initial reconnaissance of the planets.” That sounds right to me. 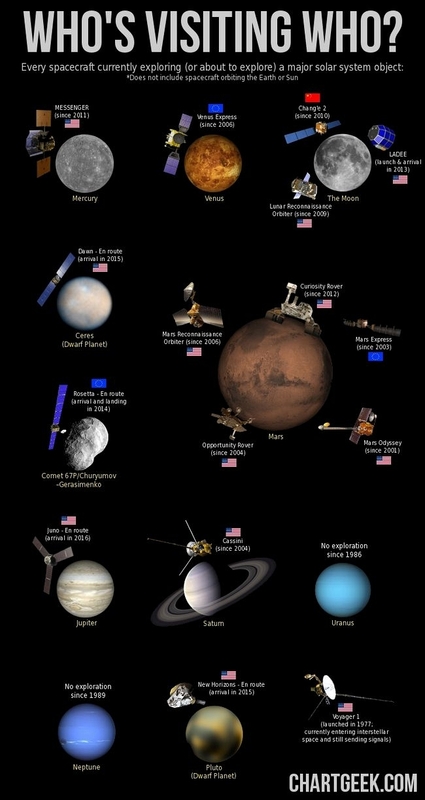 Humankind has gathered a great deal of information about the solar system. Now it is time to brainstorm some new objectives before the fickle public loses its interest and wanders off. This graphic is old…What next? There is a national consensus that we should be spending all of our money on expensive cell phones and vastly overpriced (yet disturbingly ineffectual) medical care. The space age is reckoned to be over—and space should now be left to the likes of Elon Musk and other James Bond villain-ish mega billionaires. I think this is wrong, wrong, wrong, wrong, ever so wrong. Now that we have some ideas about what is out there we should use our hard-won knowledge to do tremendous things! 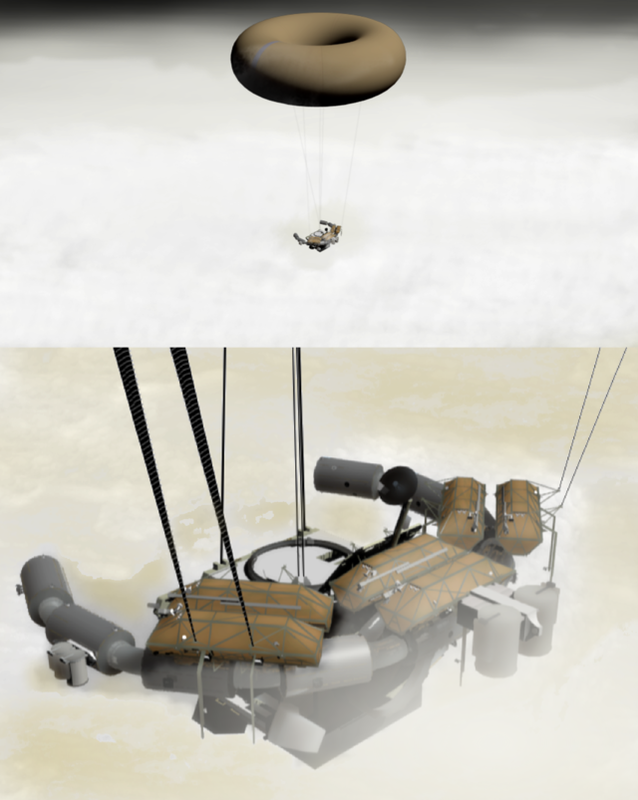 My favorite next step is an atmospheric mission to Venus. Let’s send some cool space blimps to sit in the high atmosphere of our sister planet and maybe launch some weird little drones and smaller balloons into the atmosphere. We could find out whether a floating colony is even feasible. Plus it would be like the Montgolfier brothers and the Wright brothers all over—on another world! Oooh! Can we use a donut-shaped balloon? The idea of a human mission to Mars and a submarine mission to Europa also have great merit—but I see them as more difficult and with less practical purpose. What are your favorite ideas about what to do next? This seems like a good moment to at least talk about the direction we are headed, even as we sip champagne and dance joyously about what we have done. 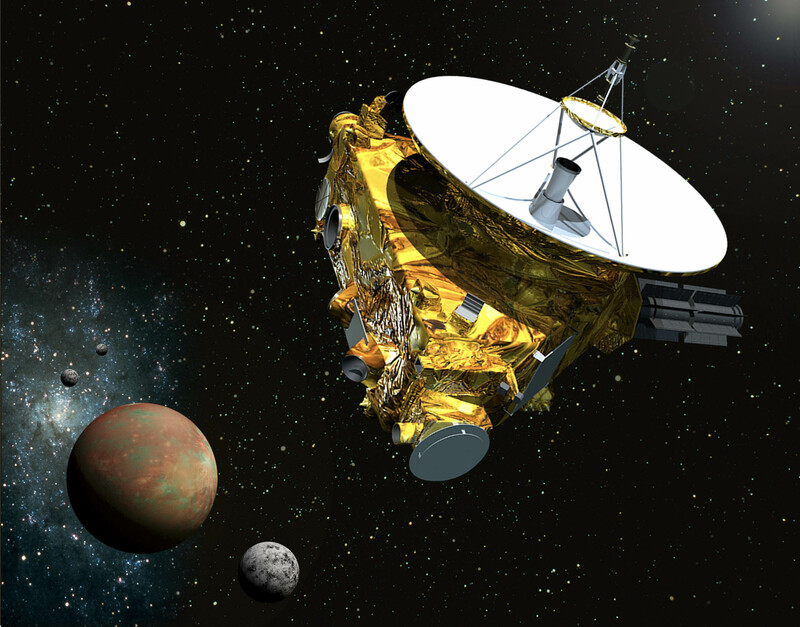 After years and years and years of waiting, NASA’s New Horizons mission is officially in its “flyby” stage. 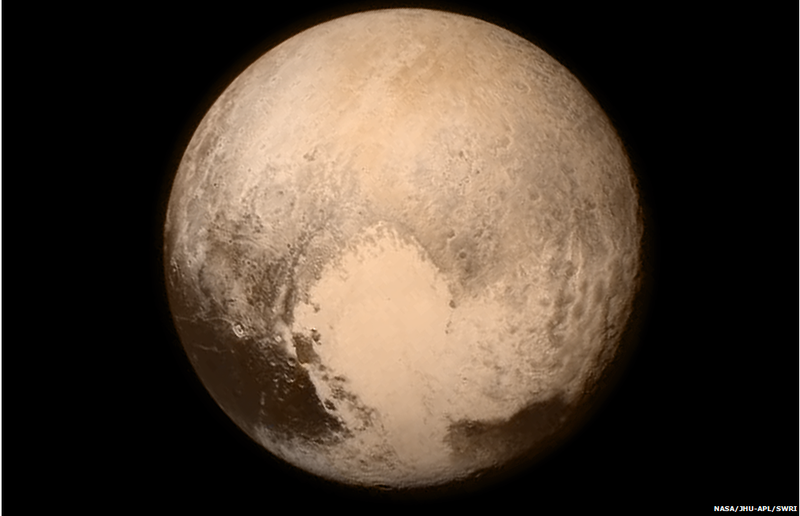 As I write, the robot probe is desperately snapping pictures and taking readings of Pluto and its moon Charon. The closest pass-by will arrive next Tuesday when New Horizons will be a mere 12,500km from the dwarf planet. Today’s post serves to alert you to keep your eyes peeled next week! I will be eagerly awaiting news of the developments and I will relay them to you as quickly as possible–although Pluto is 320 light minutes away from us (give or take a few hundred million kilometers) so nobody is going to be caught up in real time. 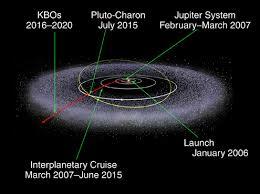 In the meantime, New Horizons is already learning more about the dwarf planet than we have ever known before: this is a mission to a world almost wholly unknown to us despite the fact that we are neighbors in the same star system! 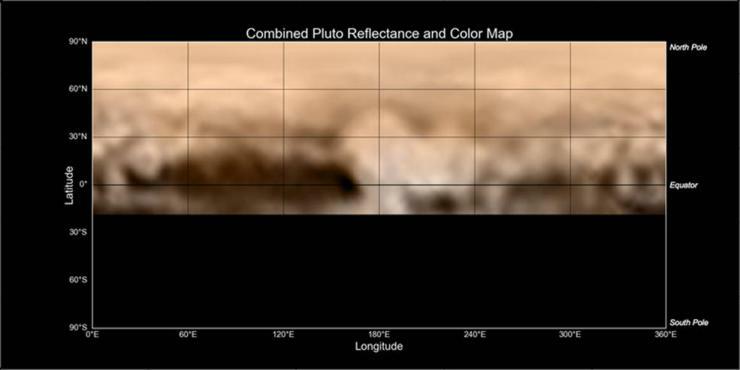 Pluto has a distinctive reddish pinkish hue and features an array of high-contrast features (presumably composed of layers of exotic ices) which, to human eyes, superficially resemble familiar shapes. Most notable is a large cardiod-shaped feature in the southern hemisphere unsurprisingly dubbed “the heart”. 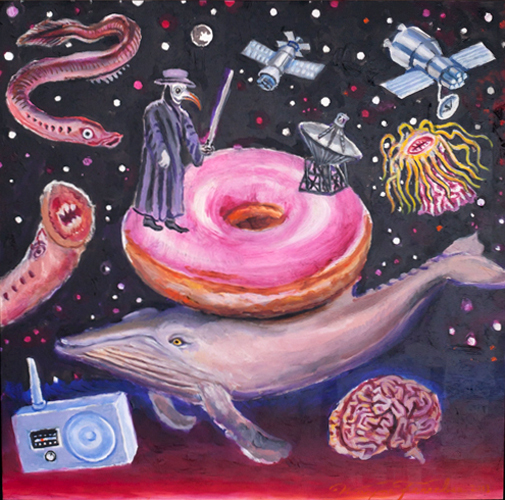 There is also a planet sized stain resembling a whale and a smaller stain which looks like a donut. No doubt we will get a better idea about these bright/dark areas during the close-up approach next week. Right now I hope people are appreciating my artistic prescience! The main thing which is currently striking to scientists (who have better things to worry about then whether methane ice looks like a whale) is how dissimilar Pluto is from its moon Charon. The two objects are closer size-wise than any other planet/moon system in the solar system, yet Charon is completely unlike Pluto in appearance and make-up. The moon, which is named after the ferryman of the underworld, is gray and nearly featureless and has no atmosphere (I should have mentioned that Pluto does have an atmosphere—at least at this phase of its strange orbit). Hooray for New Horizons! Considering where it is and what it is currently doing, I almost find it hard to think of it as real, but it most assuredly is. Also hooray for us! We have some bad moments, but we can launch a highly functional robot out of Earth’s gravity well to the edge of the solar system! It isn’t a space colony on Venus—but it’s a start. Our arms are growing longer and our apprehension keener. I almost can’t wait for next week, yet somehow I think I’ll still manage to enjoy the weekend. 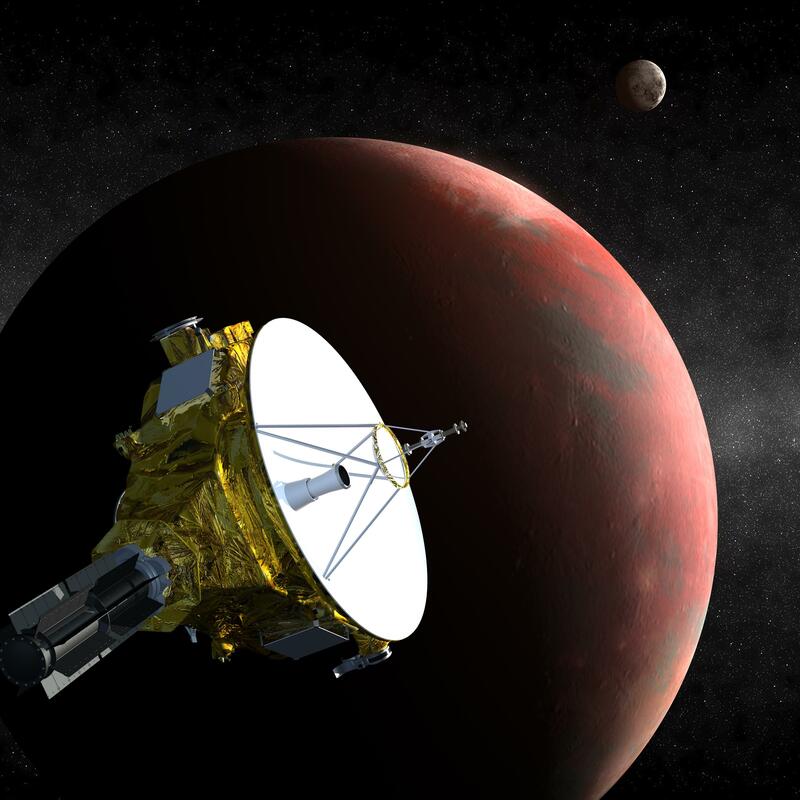 More dramatic news from the far reaches of the solar system: NASA’s probe New Horizons has awakened from its nine year hibernation and is powering up to approach Pluto! Although it sounds like “New Horizons” is a boy band, NASA gave up on trying to launch every saccharine teenybopper act into the Kuiper belt (although that is a laudable goal): instead the probe is named after the fact that New Horizons is the first human spacecraft to explore the dwarf planet Pluto and its little moons Charon and Hydra. 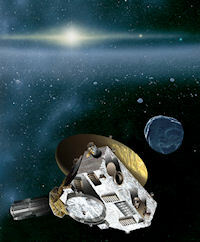 Launched in January of 2006, New Horizons set the record for the highest launch speed of a human-made object from Earth. The grand piano-sized spacecraft has spent the intervening years hurtling through the darkness of space–although it has periodically come to partial wakefulness to check in with mission control and to snap some dramatic flyby photos of famous locations along its trip (like this photo montage of Jupiter and Io). 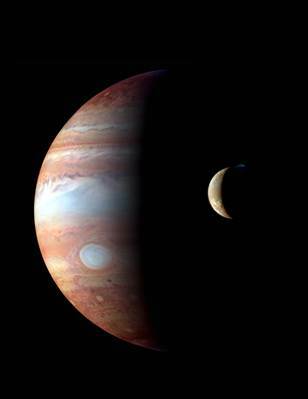 The craft also used Jupiter’s gravity well to increase its velocity. Since the time the probe was launched, astronomers have discovered two new miniature moons of Pluto: Kerberus and Styx. This means that New Horizons mission planners were forced to assess the possibility of a catastrophic collision with unseen debris or dust left over from these satellites. Computer models suggest that the likelihood of such an accident is remote, but, just in case, NASA has added two dramatic contingency plans for the mission. In one emergency plan, the probe’s satellite dish acts as a dust shield, in the other, the craft drops dangerously close to Pluto, where atmospheric drag has presumably cleared the surrounding space of particles. These worst case plans will almost certainly not be needed, although we will learn more as New Horizons gets closer to the dwarf planet. After flying past Pluto next July, New Horizons will hurtle into the Kuiper belt where NASA hopes the probe will rendezvous with an icy Kuiper belt object so that we can learn more about these enigmatic leftovers from the creation of the solar system. 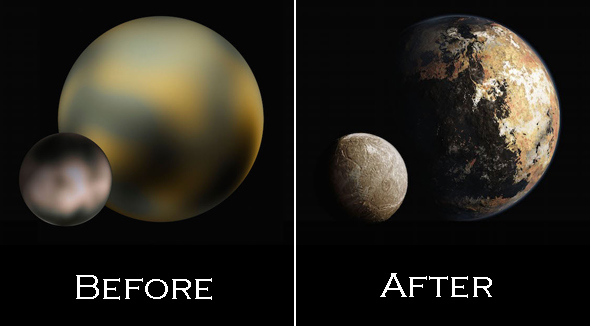 The coming 7 months should be filled with excitement as we learn more about the Pluto system!